Euro NCAP to test stability control | What Car? 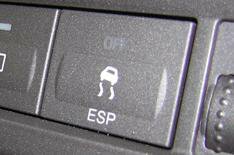 Euro NCAP is now publishing data on the effectiveness of cars electronic stability control systems for the first time. The first results on the organisations website cover more than 40 cars that were crash-tested in 2009, and all of them passed the test. The new 'effectiveness' results follow last years changes to Euro NCAPs tests, which now include the fitment of stability control as part of the overall safety rating for any car. The new stability control tests, which are carried out by Thatcham, include a double lane-change manoeuvre at 50mph under the control of a steering robot. In accordance with the global standard they are based on, they also include multiple runs, increasing the steering angle and input each time; and, on cars where the stability control can be switched off, runs are carried out with the function on and off. To rate each car, the operators record whether it is responsive to the steering and whether it is skidding or spinning. Although all cars passed the test, Thatcham criticised the location of the stability control button on the Subaru Impreza, because it thought the system could be knocked off accidentally without the driver realising. They also noted that, when the Alfa Romeo Mitos three-mode steering system DNA was set to Dynamic mode, the car failed the test. Stability control operates by comparing the drivers steering and braking actions to what the car is actually doing. If it detects that the car is veering off the intended course it is skidding, in other words it automatically applies the brakes to bring the car back in line and could help to avoid an accident. Research by Thatcham has revealed that cars with stability control are 25% less likely to be involved in a fatal accident than those without, and that there would be about 380 fewer deaths annually in the UK if every car had such a system. Currently, only 63% of new cars in the UK have it fitted as standard, but Thatcham is campaigning for it to be installed on every car.